Beethoven began composing his Missa Solemnis in March 1819 as a congratulatory gift to his friend, pupil, and patron, Archduke Rudolph of Austria, on the occasion of his election as archbishop of Olmütz in Moravia (now in the Czech Republic), intending it to celebrate the official installation ceremony to take place the following year. “The day on which a High Mass composed by me will be performed during the ceremonies for Your Imperial Highness will be the most glorious day of my life,” Beethoven wrote in a letter to Rudolph announcing the plan. Plagued with increasing deafness and occupied with numerous other projects, Beethoven missed the deadline, however, completing his mass only in 1823, the year he began major work on the Ninth Symphony, and revising it until the end of his life. 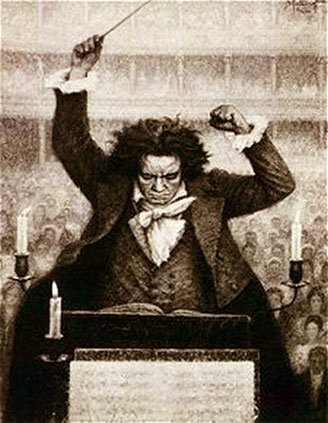 The complete score was published only after Beethoven’s death in 1827, and he never witnessed a complete performance. The Cantata Singers under David Hoose, who last performed the Missa Solemnis in 2001, assembled a large cast in Jordan Hall at New England Conservatory on Friday for a single presentation of Beethoven’s ambitious work. In a lively pre-concert talk, Beethoven scholar Lewis Lockwood, author of an acclaimed Beethoven biography (“Beethoven. The Music and the Life,” 2003) and Harvard musicology professor emeritus, compared the Missa Solemnis to the master’s Mass in C of 1807, commissioned by a member of the Esterházy family and steeped in the Viennese tradition of Haydn’s masses. In the years that intervened between the two works, Beethoven sought to expand his expressive language, reaching back to the modal harmonies of late Renaissance composers and to the fugal finales of Bach and Handel; both found their way into the late piano sonatas and the late string quartets. Raised on Bach’s Well-Tempered Clavier from age 10, Beethoven had studied Handel’s Messiah and Mozart’s Requiem and, Lockwood believes, will also have had access to a copy of Bach’s B Minor Mass. Around the same time, Beethoven, a Catholic although not a regular churchgoer, became influenced by the teachings of Eastern religious writings, and had contacts with liberal German Catholic theologians who advocated for an individual, personal spirituality. In the Missa Solemnis, Beethoven expressed his personal interpretation of the texts of the Mass Ordinary. The Kyrie opened with a massive D major chord for full orchestra, fortissimo, followed by sustained progressions dwindling to piano before the sudden entry of the chorus with a series of loud, impassioned “Kyrie!” outcries echoed by the tenor and soprano soloists. The alto announced a more lyrical tone which the chorus echoed in a free polyphonic exchange. A return to the initial choral outcries ended pianissimo. The soloists introduced the Christe eleison, in a somewhat faster ternary meter in B minor. Declaimed entreaties of “Christe” alternated with melismatic please for mercy (“eleison”) in mostly subdued tones, ending in a hushed pianissimo. The final Kyrie returned to the initial tempo and key. If the Kyrie is a prayer, the Gloria is an enthusiastic song of praise, and the Credo a recitation of Catholic belief that reenacts events in the life of Jesus. These are long, prose texts, and Beethoven set each as a series of movements-within-a-movement in contrasting moods and tempi. The Gloria opened in a dramatic explosion of rising scales for full orchestra (minus the trombones) which the chorus took up. A softer, slightly slower interlude for the soloists, “Gratias agimus tibi” (We give thanks to you) preceded a return to the initial tempo, with shifts of key that led logically into a contrasting movement, Larghetto, in F Major. Introduced by a beautiful passage for winds alone, a series of invocations and pleas for mercy from the soloists and the chorus ended in a final plea of “Miserere nobis” (Have mercy upon us). Brasses and timpani led off the final section, beginning Allegro maestoso with a stentorian “Quoniam tu solus sanctus” (You alone are holy) and proceeding to a grandiose Handelian fugue on “In gloria Dei patris, Amen” (In the glory of God the Father, Amen), another iteration Poco più allegro, and an even faster Presto that brought back the rising scale motive in the trumpets and horns and concluded with a dizzyingly high-pitched shout of “Gloria in excelsis Deo, gloria” from the chorus. In the Credo, Beethoven framed a highly expressive narration of signal events in the life of Jesus with repeated and uncompromising affirmations of Christian belief. The motto theme “Credo, credo” first appears in the trombones, in unison, to be taken up by the basses in unison with the strings and supported by the contrabassoon, and answered by the other chorus parts in quasi-fugal style. As if the fugal style itself could signify immutable doctrine, each clause in this preliminary statement of belief was treated in motet-like imitation. “Qui propter nos” (Who for us) heralded the narration to come with string pizzicati and suspenseful quiet. Extremely demanding for the chorus followed, however, taking the sopranos up to a high B-flat, fortissimo, on “descendit de coelis” (came down from heaven). At “Et incarnatus est” (And was made incarnate) vocal soloists and winds joined the chorus in whispering dialogue, ending with a passage of skillfully rendered chordal recitative by the chorus, pianissimo. All movement stopped at “Et sepultus est” (And [he] was buried), the lowest point of the entire mass. The motto theme returned full force at the words “Credo in spiritum sanctum” (I believe in the Holy Spirit) in a series of final affirmations. The final double fugue on “Et vitam venturi saeculi, amen” (And the life of the world to come, amen) came in a burst of Handelian glory. “Agnus Dei,” is a plea for mercy and peace in two large movements. The first, Adagio, contains three statements of “Agnus Dei” (Lamb of God) with contrasting scoring, each ending with “Miserere nobis” (Have mercy on us). In the first, soft chords in the horns and bassoons introduced the entry of bass soloist Mark Andrew Cleveland, his “miserere” answered by the divided tenors and basses of the chorus. Contralto Emily Marvosh and tenor Veghishe Manucharyan led the second invocation, answered by altos, tenors, and basses. Soprano Dana Varga initiated a third invocation, followed by the other members of the solo quartet and then the chorus in antiphonal repetitions of “miserere nobis” that became increasingly intense but ended pianissimo. The long second movement, “Dona nobis pacem” (Grant us peace) followed without pause, but with changes of meter (from 4/4 to an ingratiating 6/8) and tempo (from Adagio to Allegretto vivace). In a pastoral touch, ornamental turns in the strings evoked warbling bird calls. Beethoven headed the movement “Prayer for inner and outer peace” and even included two interludes in the “martial” key of B-flat that “wars” against the tonic D Major. The first interlude ended with a contralto recitative and choral response on an inserted “Miserere nobis.” The second ended with an impassioned outcry by soprano Varga and the chorus, leading to a recapitulation of the opening and a substantial coda in an exuberant D Major. Some 58 strong, the Cantata Singers chorus assembled on risers at the back of the stage. In keeping with tradition, the four soloists—soprano Dana Lynne Varga, contralto Emily Marvosh, tenor Yeghishe Manucharyan, and bass Mark Andrew Cleveland—sang from the center front row of the chorus, facilitating the many dialogues between solo and tutti forces. Orchestral players sat antiphonally: first violins on the left, trombones and string basses behind them; second violins on the right, backed by horns, trumpets, and timpani. Beethoven’s scoring for the chorus is notoriously taxing, with prolonged high tessitura and relentless rhythms. David Hoose elicited beautifully nuanced vocal sound from his singers, with precise attacks and delicate pianissimi. The soloists of the vocal quartet presented a fine ensemble of well-tuned voices: Dana Varga’s light and clear soprano matched the flexibility and clarity of Emily Marvosh’s contralto throughout her extensive range. Tenor Veghishe Manucharyan sang with particularly expressive intensity, while Mark Andrew Cleveland enhanced his well-modulated bass with rhetorically convincing delivery. Hoose led the combined instrumental and vocal forces with verve and conviction, and a fine sense of pacing and continuity. Altogether, we heard an outstanding performance of a complex and difficult work that we don’t hear nearly often enough.